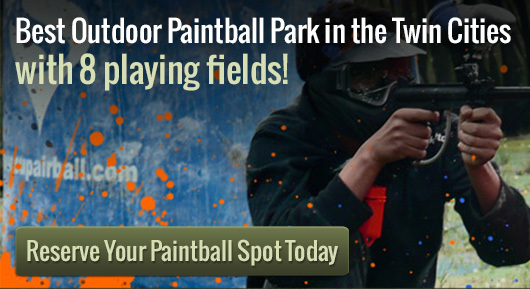 Experience Pro Paintball in MN at Action Packed Paintball. If you are looking for a way to up your activity level and have some fun in the process, some action packed play might be just what the doctor ordered. Players can get a real workout, and a serious adrenaline rush as they enjoy a real pro paintball experience. Anyone looking to spice up their normal workout regimen, should consider skipping the gym a couple of days out of the week, and engaging in a workout that only a pro paintball MN playing field can provide. Players can pick their poison, as they can choose to dodge some bullets in Wyatt Earp’s old town of Tombstone, battle their way out of Firebase Alpha, hold the line in the Civil War, or find their way out of the jungle. Action Packed Paintball has some of the best outdoor paintball in MN. The opportunity to get the blood pumping, the brain strategically thinking, and in a setting that allows players to let off a little steam is what a pro paintball MN experience has to offer. Besides all of that, the experience is flexible too, because players have the option of scheduling private reservations, or walking onto a game. Private reservations can be made at any time. Groups up to 150 players can make reservations to partake in the fun, and if by chance there are members of a group that wish to have a seat to watch everyone else get splattered, there are spectator areas on the fields to accommodate those folks that prefer to watch. In addition spectators and guest alike can cook out on one of the onsite outdoor grills, and just hang out in the dining area. There are also well maintained indoor restroom facilities. Remember to call us at 952-492-6776 in case you have any questions or if you would like to book a time. Please get in touch with us as soon as possible, as advanced reservations are required.